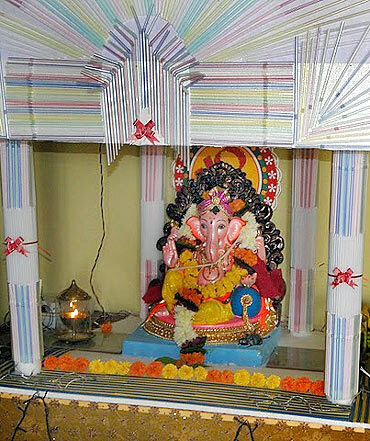 We asked our readers to send us their images of Lord Ganesha. Here are some stunning images sent by our readers. 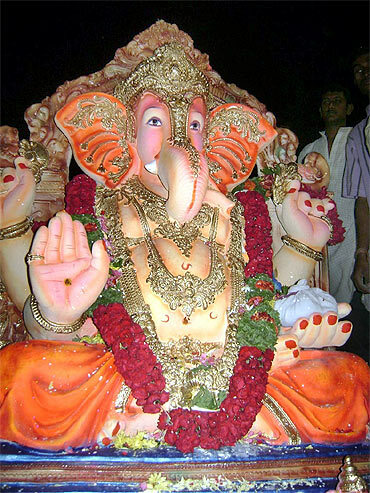 Send us your pics of Lord Ganpati! 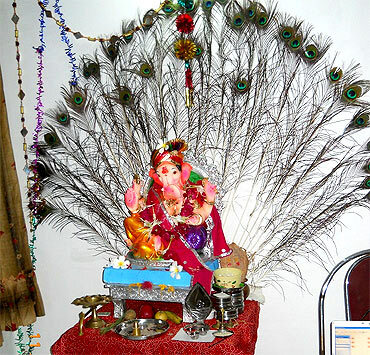 Ashish Ganjkhane sent us this photograph of the eco-friendly Ganesha at his residence in Baroda, Gujarat. Vinay Joshi from Mumbai sent us this photograph. Praveen Kolekar from Bangalore sent us this photograph. 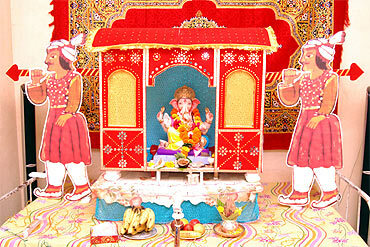 Praveen says that his friends get together every year to celebrate the festival. 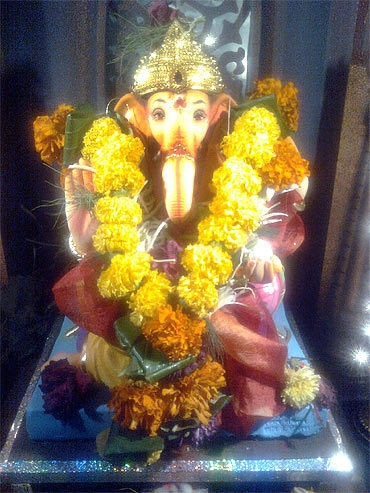 Ishita Anupama from Powai in Mumbai sent us photograph of their Ganesh idol. 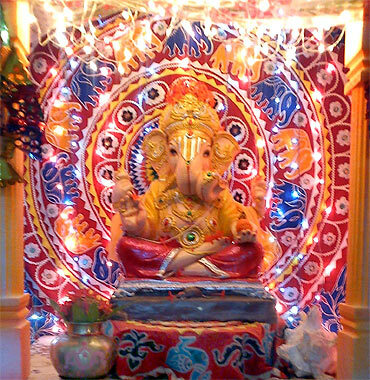 Kumar Shetty sent us the photograph of the Ganesh idol at his friend Sunil Mohite's house in Thane. 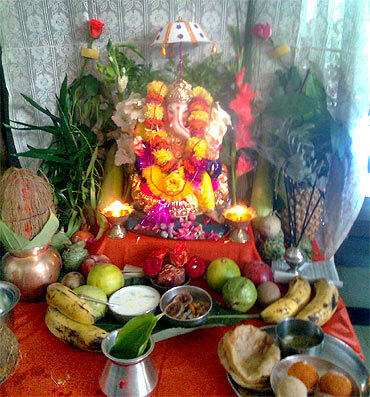 Chandrasheker Mhamunkar sent us this Ganpati photograph from Kalyan, Maharashtra. 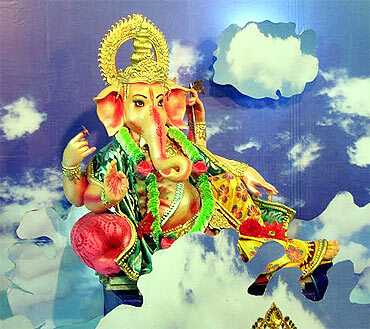 Nempu Guru took this picture of Lord Ganapati in one of the malls at Bangalore. 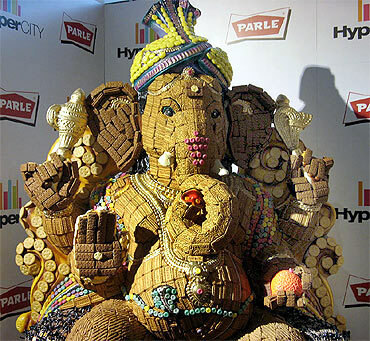 This unique idol is made out of biscuits, cookies, candies and chocolates. 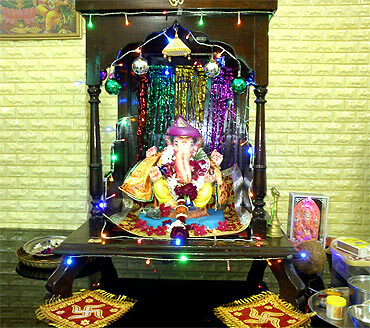 Kumar Shetty sent us photograph of Lord Ganesha's idol at the residence of his friend Dilip Kakde at Dadar, Mumbai. 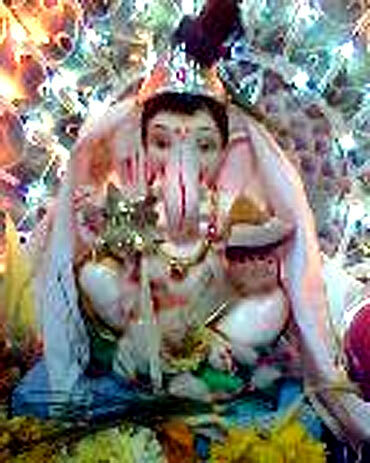 Prasanna Sathe sent us this photograph of the Ganpati idol installed by the Purvanchal Maharashtra Mandal at Anand Vihar in New Delhi. 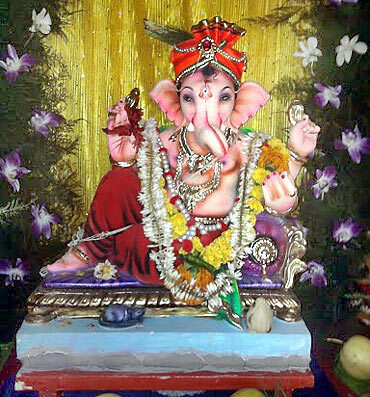 The theme of this year's idol is "Ganpati -- Lord in the Sky", says Sathe, adding that the idol is made of eco-friendly material and that special care has been taken to ensure that there are no remnants (like POP or steel wires etc) from the idol after the visarjan. 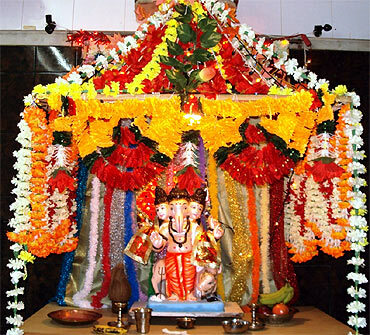 Even the material used for decoration like is all reusable, he claims. 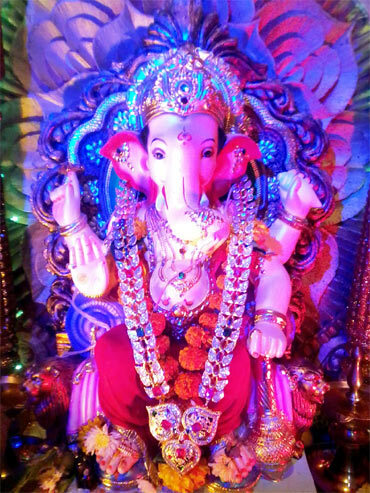 Manoj Madugula and family sent us this photograph of the Ganpati idol from Kolshet road, Thane. 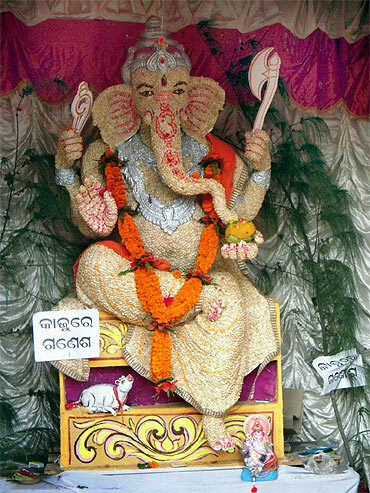 Manoj says that the decoration has been done using straws. 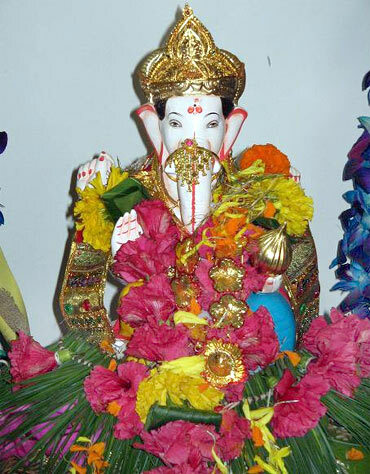 Rakesh Haritwal sent us photograph of his Ganesha from Bhayander in Thane district of Maharashtra. This is the first year of celebration at our house and we are enjoying a lot, he says. 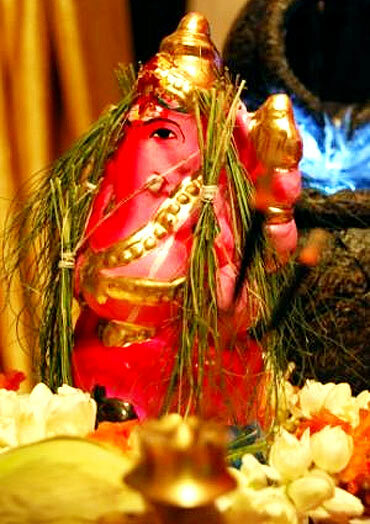 Nalini J Kudalkar has been visiting his boss's house in Mira Road near Mumbai since the last five years to offer prayers to Lord Ganesha. He sent us this picture. 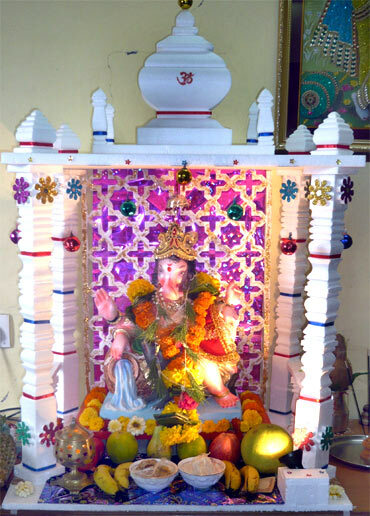 Mahesh S Ahire' wife Pallavi came up with a unique idea this Ganeshotsav. 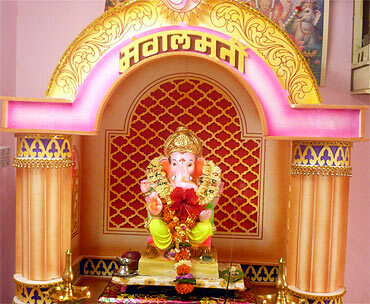 She worked on an idol themed 'Doli with Ganpati'. Mahesh, who hails from Mumbai, shared it with us. 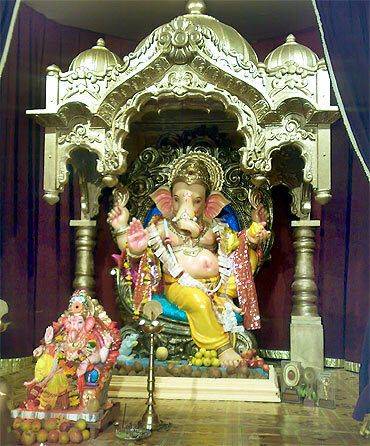 Kalpesh Maloo from Ahemdabad, Gujarat, sent us this photograph of Lord Ganesha seated at his brother Smit's home.